I don’t approve of taxpayers having to fund big sporting events but I am glad that Glasgow has won the 2014 Commonwealth Games. Better that our money be spent on infrastructure than most other state boondoggles. And one of those beneficiaries of the state is the BBC. Isn’t it astounding that the Beeb managed to screw up Glasgow’s big moment? Come on now – it’s not like it’s every day that the Queen gets invited to Celtic Park. 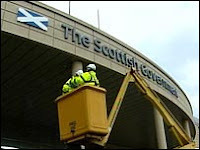 The Scottish Executive is to be rebranded as the Scottish Government, it has been confirmed. A new Scottish government sign has been put in place outside its Victoria Quay building in Leith, replacing the existing Scottish Executive sign. I always hated the Labour government’s policy of leaking news to friendly journalists who could then write: “The minister will announce today…” How did they know that the minister wouldn’t be struck down by a bolt of lightning before making his pronouncement? I suppose the weather’s been nationalised just like the BBC. When journalists say that something will happen, the event should be in the future and should definitely occur. Despite reports in our local newspaper, Scotland hasn’t yet become independent. One of those who wish that we were independent is Mike Russell MSP. I’ve met Mr Russell once or twice and think that he’s one of the good guys: he doesn’t believe that everything should be done by the state, an opinion that’s far from universal in Scotland. Yet even so, the whole thing was undoubtedly skewed in favour of the status quo. The choice of non-speaking guests depended heavily on the Scottish establishment who are far from representative of Scottish opinion. Knowing many journalists and broadcasters as I do, however, I think that it is an institutional bias that is at fault. The BBC as a corporate body is part of the British establishment and its thinking is based on the continuation of that establishment as it is. The organisaton simply cannot envisage the validity of other choices, and consequently its actions are dictated by that intellectual blind spot. Precisely. And that’s exactly why the state shouldn’t be involved in broadcasting any more than it should be running newspapers. Now I agree entirely that the Scottish license fee payer gets a raw deal from the BBC. Scottish broadcasting output is way below our contribution to the “national” kitty. But that’s par for the course in centralised Britain. The question is, though, should we expect a Scottish state broadcaster to be any different? Indeed, a broadcaster with only 5 million home customers might well be even more in thrall to its own local establishment than is the Beeb. And an independent social democratic Scotland certainly would have its own establishment that wouldn’t be representative of Scottishopinion. And the real jewel in the crown – the guaranteed impartial, honest and high quality broadcasting service on which we should rely, and for which we are each as citizens prepared to pay – becomes tarnished , brittle and then broken. But the BBC’s not “impartial”, is it? There is no guarantee. Why should we expect a Scottish state broadcaster to be any different? I’m certainly not “prepared” to pay for one voluntarily. If Mike really wants Scotland to be an example to other countries why doesn’t he campaign for a totally free market in broadcasting? Let’s have a hundred Scottish Broadcasting Companies. Over on Iain Dale’s site he mentions a BBC report about the forthcoming Internet TV station, 18 Doughty Street. I had to pour myself a wee dram. “It will maintain the BBC values of accuracy, editorial independence, impartiality, while balancing a wide diversity of views.”The BBC yesterday said its new television service would be “free from commercial, political and religious affiliations or pressures”. I suppose it’s possible that some BBC people really believe this nonsense. I’ve watched the Beeb for long enough. Will they refund my licence fee so as I can try the competition for a while? Comments Off on Now, they’re getting it! Wark was subjected to long-term behind-the-scenes scrutiny by her own managers, a team of broadcast executives, who checked out her performance on air for anything which might give rise to accusations of bias. Let’s think about this. Is the Beeb concerned that Ms Wark could be a secret admirer of David Cameron? Was she seen campaigning for the LibDems in Dunfermline? Is she thought to be a closet Nat? Concerned corporation governors put Wark under “review” amid fears that her relationship with the First Minister, together with her closeness to former Labour leader Donald Dewar and her role in the Holyrood parliament building, could be damaging to the image of the BBC as an impartial broadcaster. Labour! Who’d have thought it? My parents gave me a watch for my twenty-first birthday and it’s still in use all these years later. Now and then it gains a few minutes so when I got up this morning I thought that I’d do a time check with the BBC’s teletext service before changing the watch and all of our clocks to wintertime. Imagine my shock when I eventually worked out that the Beeb was still on summertime! A few minutes ago they were showing 1338. The rest of the country was at 1238, including those capitalist channels 3, 4 and 5. At their best, they provide an authentic new source of first-hand information. They break stories. They challenge professional reporters to get it right. They keep the media honest. They increase the flow of information. In that context, it doesn’t matter that most of them are rubbish. And still they claim to be unbiased! Comments Off on And still they claim to be unbiased! I do think that the Conservative response is far too mild. If I were Michael Howard I’d announce that no Tory would appear on any BBC programme or answer questions from any BBC journalist until after the election. Would the BBC be legally allowed to cover othercandidates in such circumstances? Further evidence of Beeb blinkers was the fact that story of its own 176 job cuts was the lead on Reporting Scotland last Monday. On the same day, Babcock at Rosyth announced 320 job losses and this didn’t merit a mention. Is this the kind of quality journalism that Mr Low seeks to maintain? It’s the way you tell them. A COMMERCIAL broadcaster is promising to challenge the BBC’s “boring” and “leftish” current affairs coverage by launching a rival radio station. Scottish Radio Holdings, which already owns a number of stations north of the Border, will apply to media regulator Ofcom this week for the new FM licence covering Edinburgh, Fife and Lothians. There again, they don’t really get it, do they? In the mind (sic) of the typical BBC operative anyone not a paid-up member of the Guardian-reading class must be some kind of deviant to the right of Genghis Khan or even George Bush. Yes, it’s time to own up. I have just been watching the BBC’s Reporting Scotland programme. Tonight they were covering the “fringe” parties contesting the elections for the European Parliament. So there we have it. According to the taxpayer-funded BBC, opposition to the Euro and the EU is racist. I wonder how “neutral” the rest of their election reporting will be. You can watch the segment here (about 16 minutes into the programme), although I think that tonight’s broadcast is only available until this time tomorrow. I have of course made a tape recording. There has been an unexpected applicant for an important position at the BBC.